In 1977, David Shelton and Kenneth Von Bargen (University of Nebraska) published an article called “10-1977 CC279 Gear Up – Throttle Down”. It described the merits of reducing tractor rpm’s for trailed implements that didn’t need 540 rpm to operate. In 2001 (republished in 2009), Robert Grisso (Extension Engineer with Virginia Cooperative Extension) described the same fuel-saving practice. Again, it was noted that many PTO-driven farm implements don’t need full tractor power, so why waste the fuel? He tested shifting to a higher tractor gear and slowing engine speed to maintain the desired ground speed. 700 diesel tractors were tested, and as long as the equipment could operate at a lower PTO speed and the tractor itself didn’t lug (i.e. overload), as much as 40% of the diesel was saved. For airblast operators with PTO-driven sprayers and positive-displacement pumps, this has a lot of potential. 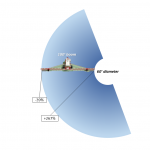 Gearing up and throttling down (GUTD) can reduce the PTO speed from 540 rpm to somewhere between 350-375 rpms, which not only saves fuel but more importantly slows the fan speed. This is an excellent option when the fan is overblowing the target, even in low gear. Ground speed remains the same and so does operating pressure, so there is no need to re-nozzle or recalibrate. Slowing the fan speed can improve coverage. 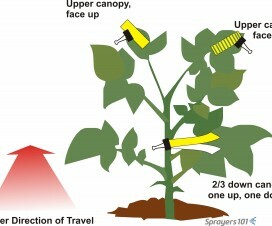 In early season, crops have relatively empty canopies. When an airblast sprayer passes by, a significant portion of the spray is blown through the canopy without actually hitting the target. This is because the air carrying the spray is moving so fast that it causes droplets to slipstream around targets. The smaller the droplet, the more likely this will occur, as smaller droplets have smaller settling velocities and are slaves to the entraining air. 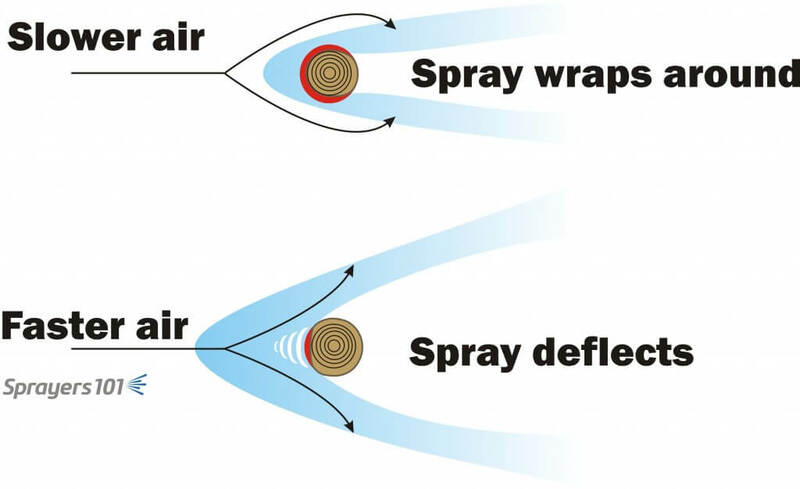 For example, when applying dormant sprays in orchards, only the wood on the sprayer-side gets wet (not all the way around); the high-speed air is deflected. However, with slower air, the air stream wraps around the wood to wet more surface area. Even fans in low gear often produce too much air for dormant applications, depending on the wind conditions. Have you ever done a belly flop? 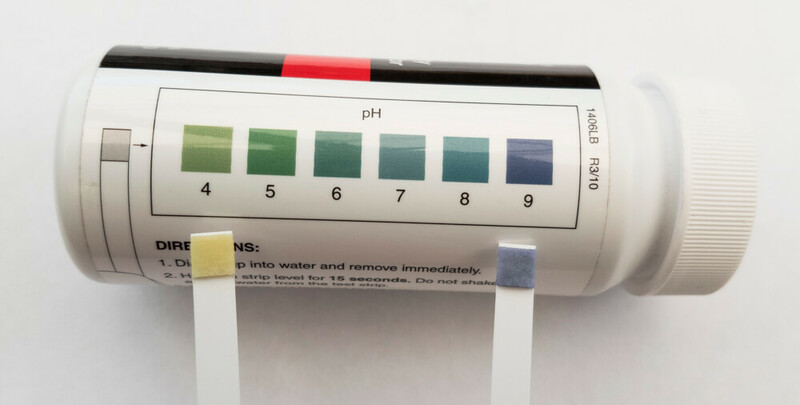 As you painfully sink to the bottom you might be wondering how “soft” water suddenly got so hard. When you compress water with force, it pushes back. 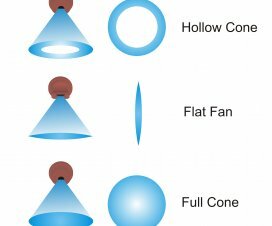 It’s similar with air: when air pushes very hard against an object, it compresses like a hard shield and the rest of the air deflects around it. If the air is supposed to deposit spray, that’s difficult to do through a hard shield of compressed air. What’s more, the deflected, fast-moving air will carry the spray along with it, missing the target. Using slower air will deposit more spray (red) around a branch, as shown here in cross-section, because it wraps around the branch rather than deflects. Faster air becomes compressed and deflected as described, depositing less. Spray operators can see this theory in practice by looking for wet wood during dormant oil applications. 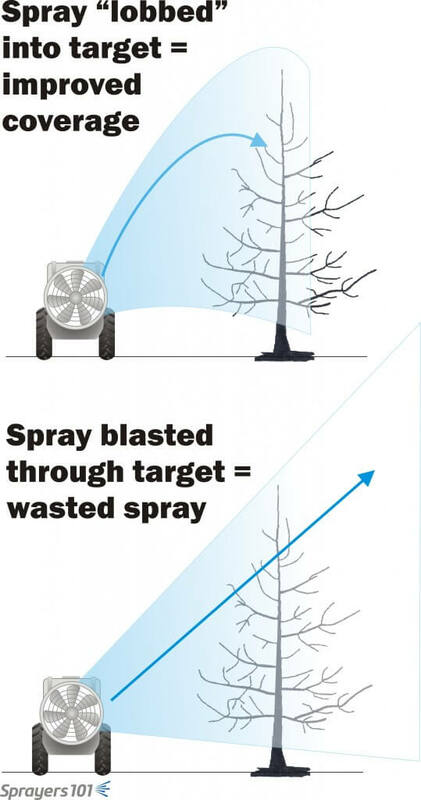 The goal of GUTD for airblast sprayers is to use enough air to get the spray to the top of the target canopy, compete with any wind, and make any leaves flutter to expose all surfaces but not blow the spray through the target into the next alley. Most of the spray that penetrates into the next alley lands on the ground (eventually) or simply drifts away. 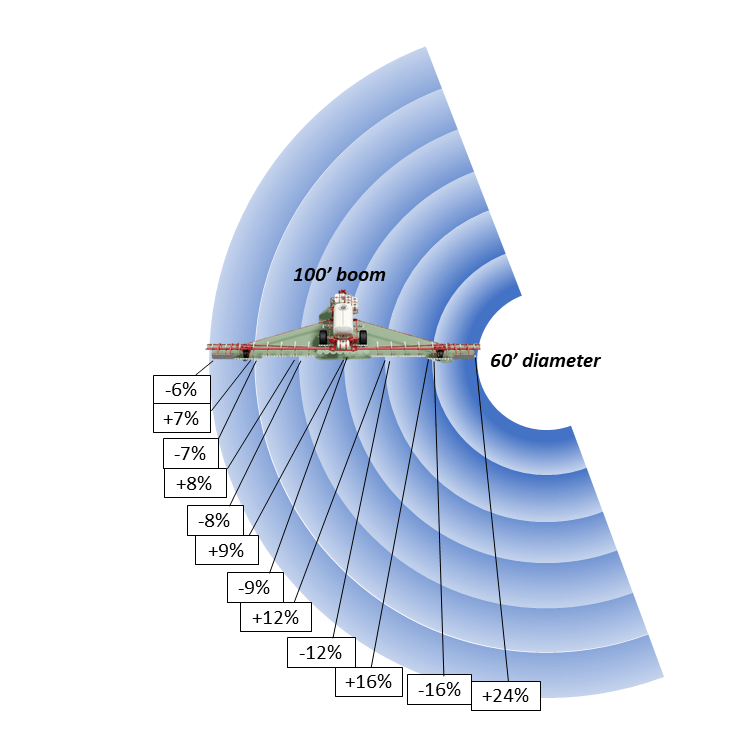 Slowing fan speed may allow the operator to improve coverage and reduce spray volume at the same time. 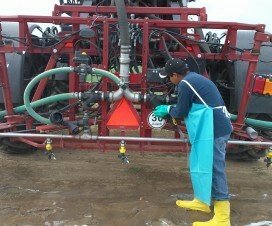 Use GUTD to reduce blow-through, improve coverage and potentially reduce the amount of spray required. GUTD only works on airblast sprayers with positive displacement pumps (e.g. piston, diaphragm or roller). Airblast sprayers with centrifugal pumps, common in Ontario, would experience a drop in operating pressure and would have to be re-nozzled. 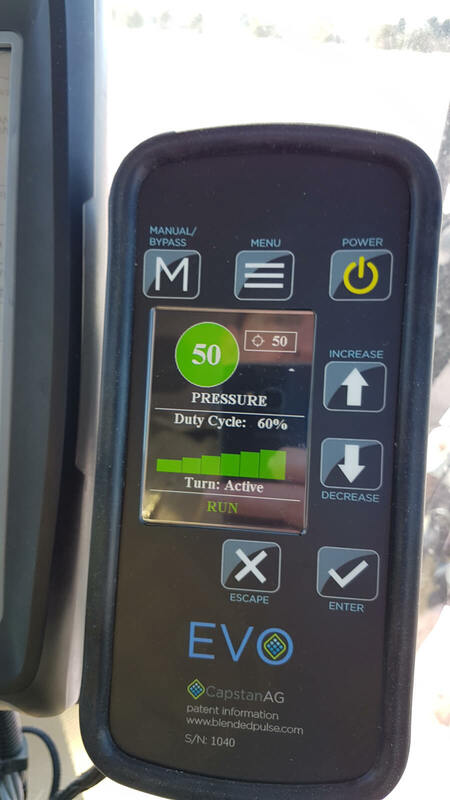 If the sprayer is already operating at pressures above 150 psi, this may be desirable because operating pressures that high aren’t often necessary. GUTD is also not intended for air-shear sprayers (e.g. Kinkelders, certain AgTecs, etc.) 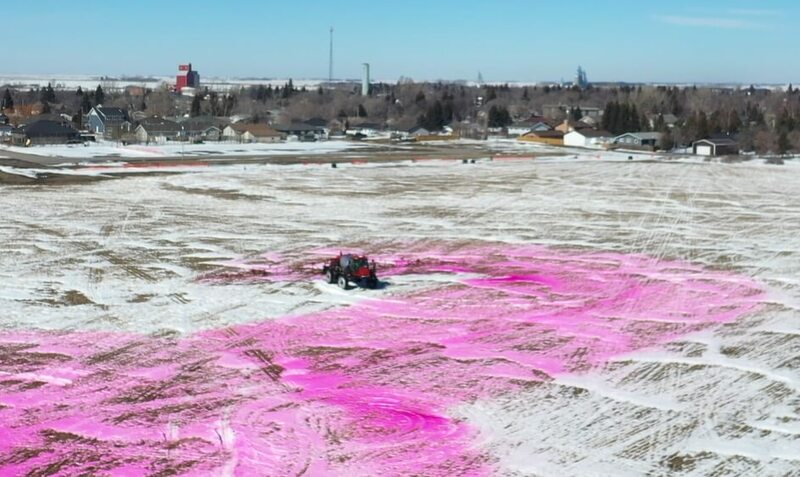 because dropping air speed below a certain threshold may compromise spray quality; the air needs to be fast enough to create and direct spray droplets. When we first experimented with GUTD back in 2013 we noticed how much quieter the sprayer was – the noise level dropped considerably. One grower shifted to GUTD settings in the middle of a dormant oil application in pears and noticed the trees immediately began to drip with excessive coverage. These are positive results. 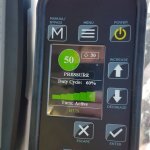 However, in one instance the operator was already applying a low spray volume per hectare using air induction nozzles and the lowest fan gear. 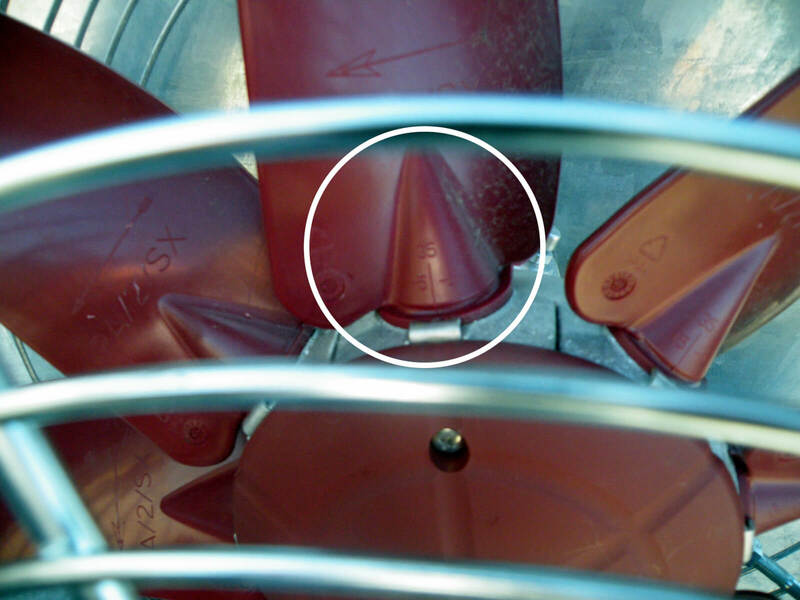 By further slowing fan speed using GUTD, coverage at the top of his cherry trees was compromised. Airblast sprayers with centrifugal pumps or air-shear nozzles make GUTD very complicated, and the method may not work. Growers that are already using very coarse spray droplets, reduced volumes and the low gear on their fan may compromise coverage with GUTD. This is particularly relevant when spraying distant or dense canopies, because Coarse droplets may fall out of the air before they get to the target. 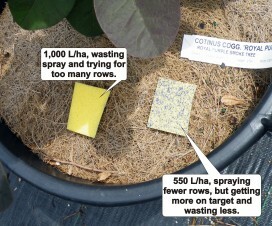 Growers performing alternate row-middle applications should not use GUTD. If the tractor begins to lug (e.g. black smoke, sluggish response, strange sounds), GUTD won’t work. This method is most useful during dormant applications, spring fungicide applications and in young or sparse crops. In short, GUTD works beautifully when it’s used correctly. 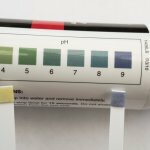 If you want to try it, used water-sensitive paper to establish a base-line with your current practice, and then confirm the coverage after you change your sprayer settings. Be prepared to see great results. Some airblast sprayers, like this one, feature fan blades with adjustable pitch to increase or lower air volume and speed. It’s often a pain to try to adjust them, and most operators only try it once. 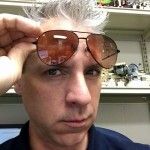 Jason has been the OMAFRA Application Technology Specialist since 2008. He has a BSc (Biopsychology - Mt. Allison), an MSc (Plant Science - York) and a PhD (Plant Cell Physiology - Guelph). Jason is interested in improving the efficiency & efficacy of agricultural pesticide applications, he is the author of the Airblast101 Handbook and he runs slowly.